Lightweight and durable aluminum construction is ideal in the field, studio, or classroom. Features a silver finish with clear hardware. Spring-loaded, locking canvas support holds artwork in position. Finely crafted design features a rectangular profile frame for extra strength, two sets of shelf brackets to fit a greater range of canvas and pad sizes, and a reinforced 17½" canvas shelf that includes a panel groove to hold all kinds of work securely. Accommodates deep cradled canvas up to 1¼" thick and canvases/panels 6" to 48" in height. Retractable legs allow this easel to double as a tabletop easel. 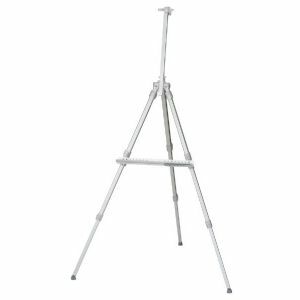 Pivoting feet stabilizes easel on unlevel ground. Includes brush holder/basin hook. 76" height when fully extended and only 27" when folded. Convenient carry bag with shoulder strap also included.